أحب جدًا هذه الصورة التي رسمها صديقي رون ديسياني (Ron DiCianni)، كي توضع في الكتاب الذي قمنا بتأليفه معًا، بعنوان "أخبرني عن السماء" Tell Me About Heaven. فكما حملت الملائكة لعازر إلى السماء في الأصحاح السادس عشر من إنجيل لوقا، هكذا أـيضًا كان هذا الشيخ يُنقَل إلى يسوع. لكن هل تكمُن مشكلة في أن أقول: "لستُ على يقين يا أمي من استماعك إلى هذا، لكن إن كنتِ تسمعينني، فقط أريد أن أشكركِ لأجل اعتنائك بي دائمًا. أحبك وأشتاق أن أراك ثانية، وأتحدث معك، وأن تريني بعض الأماكن الرائعة هناك". لديَّ بعض الأصدقاء القدامى في السماء، من بينهم جريج وجيري، الذين أفكر فيهم أحيانًا وأطلب من الرب أن يحييهم نيابة عني. وسواء فعل الرب هذا أم لا، فالقرار يعود إليه. لكن كانت علاقاتي بهؤلاء الأخوة هبة من الله، ويومًا ما سأراهم ثانية في محضره. وأعتقد أن الله يسر بشعوري بالارتباط بهم، وهو بالتأكيد يدرك جيدًا روابط الصداقة. فقد دعانا يسوع "أحباءه" (في الإنجليزية "friends" أي "أصدقاءه"). وهو أفضل صديق قد حصلتُ عليه يومًا. لديَّ اعتقاد راسخ بصحة هذا؛ لكن حتى إن كنت مخطئًا (فإنني بالتأكيد لا أستطيع أن أعرف بالتحديد متى يسمح الله للناس برؤية الأحداث على الأرض ومتى لا يسمح لهم بهذا)، لن أكون مخطئًا إن صليتُ قائلًا: "يا رب، من فضلك أخبر أمي بأن حفيدتيها الغاليتين تحبانها من كل قلبهما، وأنهما تزوجتا من رجلين يحبانهما أيضًا. سيعني هذا الكثير لها". Can or Should We Talk to Loved Ones in Heaven? I love this painting by my buddy Ron DiCianni, for the book we did together, Tell Me About Heaven. As the angels carried Lazarus to Paradise in Luke 16, this is Gramps being transported to Jesus. I’d like to address a question that came up in a blog comment. I figure other readers might have read the question and may be interested, since I've been asked it many times over the years. First, would it even be possible for someone in Heaven to know what's happening on earth, and be able to hear us say anything? Many assume the answer is no. But in Matthew 17, Moses and Elijah clearly already knew the events going on when they appeared with Jesus on the mount of transfiguration. 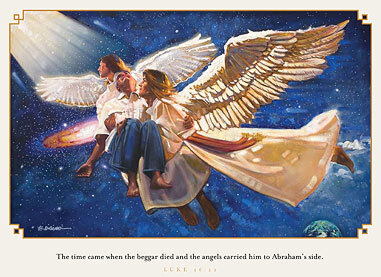 In Luke 15 Jesus speaks of rejoicing in the presence of the angels, not BY the angels but in their presence, whenever a sinner repents, suggesting God's people in heaven rejoice at God's work in lives on earth. To rejoice at it, they obviously must be aware of it. And Revelation 6:9-11 shows martyrs in Heaven who are clearly aware that God hasn't yet brought judgment on those who persecuted them, and are wondering why. So they know some of what's happening on earth. Okay, so if it's possible someone in Heaven could hear us, is it right to talk to them? First, there's a huge difference between talking to someone and praying to them, and it's critical we keep that clear. When people pray to Mary and the saints, they are calling on them as intermediaries, asking them to intervene and exercise power in this world. There is no biblical basis for this. Since 1 Tim. 2:5 says Christ is the only mediator between God and men, it would violate this to pray to those in heaven. We're not to pray to people or to angels, but only to God. But would it be okay to say, "I'm not sure you can hear this, Mom, but if you can I just want to say thanks for how you always watched out for me. I love you and I'm looking forward to seeing you again and talking and having you show me some special places there." That's talking to someone, but it's NOT praying to them, calling upon them to do something, or to exercise power or talk back. Seeking to call up from the dead or to hear from the spirits of the departed is a forbidden occult practice (Deut. 18:9-14). But that's very different than doing what I just described. Personally, rather than talking to a loved one, I am more comfortable simply praying to Jesus or the Father (there are biblical examples of praying to each) and saying, "Lord, would you please give my mom a hug, and tell her it's from me?" Now I think my mom sometimes sees what's going on here and might hear this when I say it, but I KNOW God hears it. And I trust God to do what He knows is best. Does that make sense? I have some old friends in Heaven, Greg and Jerry among them, that I sometimes think of and ask the Lord to greet for me. Whether He does that is His call, but my relationships with those brothers was a gift from God, and one day I'll see them again in His presence. I suspect God is pleased with my sense of connection to them, and certainly He understands the bonds of friendship. Jesus called us his friends. He is the best friend I've ever had. I could see how a person speaking to their departed loved one, even if they're not violating Scripture (since they're not praying to them or calling on them), could become unhealthy or obsessive. But that's not likely to happen when we're talking to God about them. He invites us to come to Him with what's on our minds and hearts. Obviously your loved one is on your mind and heart. If your child or wife or husband or parents or best friend are with Jesus, God understands your desire to feel connected to them, and to want them to know of your love for them, and that you miss them and look forward to seeing them again. So, bottom line to the person who asked the question, as long as you're not praying TO your loved one or FOR your loved one (who needs no prayer now), but to God ABOUT your loved one, and your feelings, and your desire for them to know something, I think there's nothing in that which violates a Scripture. Just be careful it doesn't shift into anything that treats them as intermediaries or leads to obsession or seeking contact with them, which is expressly forbidden. 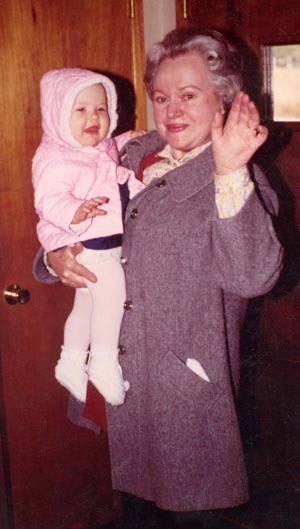 Here's a picture of my Mom at our house, holding our oldest daughter Karina. Mom died just four months after our Angie was born. I said at both our daughters' weddings, in the summer of 2001, that I believed their two grandmothers were watching from heaven. And since Nanci's mom had been blind her last few years here, she was seeing the wedding in a way she couldn't have even a few months earlier before she died. I firmly believe this is true, but even if I was wrong on that point (since of course I can't know exactly when God allows people to see events on earth and when He doesn't), I would not be wrong in praying "Lord, please tell Mom her precious granddaughters love You with all their hearts and married young men that do too. That will mean so much to her." My guess is that Mom knows all that anyway, and that she is enjoying seeing God at work in the lives of our grandchildren, her great-grandchildren she hasn't yet been able to hug. (It's odd to me that so many assume people in Heaven are ignorant of what's going on here on earth where the great drama of redemption is unfolding—wouldn't we think they'd be more enlightened, not less?). Still, it doesn't hurt to ask God, the Giver of special relationships. He is gracious and understanding of our thoughts and feelings and love for the precious people He has put in our lives.